Carol Adams was a 17-year-old high school senior when her father shot and killed her mother in their home. The Wednesday afternoon program not only coincided with Women’s History month, but fell on a day in which President Barack Obama commuted the sentences of 61 men and women convicted of non-violent drug offenses. To date, Obama has pardoned 268 individuals—more than the past six presidents combined. Dozens of stakeholders were on hand: ex-offenders, relatives of the incarcerated, women in law enforcement, legal advocates, government officials and others pushing to improve the justice system. National data shows the number of women prisoners has dramatically increased in the U.S.—by some 600 percent— between 1980 and 2011. More than 200,000 women are in federal and local jails across the country, approximately a third of them for drug offenses. African-American and Hispanic women are disproportionately impacted. Dialogue during the discussion centered around improving criminal justice outcomes for women, be it via more equitable sentencing guidelines in the courtroom, or increased educational resources for those in the cell block. Addressing the gathering, Lynch noted that incarcerated women face specific challenges that distinguish them from their male counterparts. These factors range from a greater likelihood of past trauma i.e. sexual abuse and substance use, to higher levels of mental illness and other medical conditions. Moreover, women are typically the primary caregivers of their children prior to incarceration. “Put simply, we know that when we incarcerate a woman we often are truly incarcerating a family, in terms of the far-reaching effect on her children, her community and her entire family network,” said Lynch. Some 2.7 million youth in America have parents who are incarcerated, national data shows. Panelist Yasmine Arrington, who’s in her 20s, shared with the audience that her father was behind bars for much of her life. Raised by her grandmother after her mother died, Arrington spoke of the stigma kids often face at school and in the community when peers learn they have a father and/or mother in prison. Besides emotional angst, there are practical concerns: trying to visiting a parent who may be housed in a facility far from their home state, and simply keeping in touch. “Phone calls are expensive,” said Arrington, a college grad who founded a nonprofit, ScholarCHIPs to help children of incarcerated parents obtain scholarships for higher education. Her work has been nationally recognized by organizations such as `Black Girls Rock,’ among others. While poverty can be a factor in terms of who winds up in prison, Andrea James spoke of growing up amid a family of privilege on Martha’s Vineyard before a mistake led to her incarceration. “I was an attorney,” said the Executive Director and founder of Families for Justice as Healing. 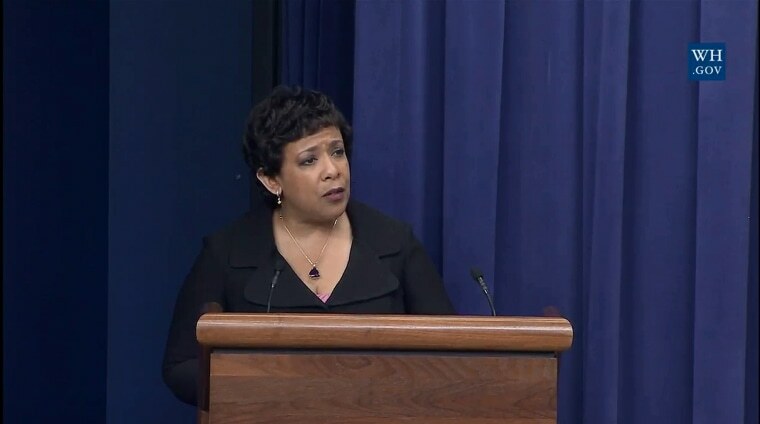 Lynch outlined attempts by the Department of Justice under the Obama administration designed to help incarcerated women become successful, productive members of society. For instance, last October, the department’s Office of Juvenile Justice and Delinquency Prevention (OJJDP) released its groundbreaking Girls Policy. It identified a range of issues that affect young women – from family violence to sexual exploitation – and committed to providing support ranging from technical assistance, to grants, research and data collection support for states, tribes and local communities. A few weeks ago, the National Girls Initiative and OJJDP, working in partnership with DOJ’s Office on Violence Against Women, held a roundtable to explore the unintended consequences of mandatory arrest laws for domestic violence on girls of color. NGI will be hosting additional roundtables to examine subjects such as pregnant and parenting girls in the juvenile justice system, to girls’ courts that link at-risk young women to community resources, counseling and social services. Additionally, said Lynch, the federal Bureau of Prisons is working to implement and expand a range of gender-responsive initiatives. Among them: the `Mothers and Infants Together’ program which allows eligible pregnant inmates to live in community-based centers during the final trimester of pregnancy and to stay with their child during the critical early months. The Attorney General noted other efforts such as “safe, supportive" residential reentry programs for women transitioning from prison to the community that offer employment counseling, job placement, financial management assistance and other services; initiatives aimed at women who struggle with substance abuse or mental health issues; and increased efforts to protect the rights of transgender women in American prisons. Valerie Jarrett, Senior Advisor to president Obama and Chair of the Council on Women and Girls, lamented “all the talent being wasted in prison” and the $80 billion-dollar cost to taxpayers. Still, Jarrett said she’s been heartened by recent bi-partisan legislation moving through Congress centered around justice reform. This issue must go beyond data, she said.